Sweetwater has launched some of its 2018 Black Friday deals a little early this year! 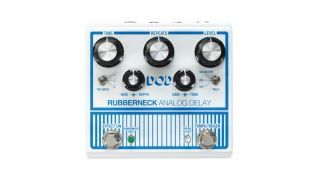 The music retail giant is now offering a steep discount on DigiTech's DOD Rubberneck Analog Delay pedal. Usually sold at $249.95, the pedal is now available for just $149.95. Even better, this offer doesn't end until December 31, so if you it slips your mind on Black Friday, it'll still be available at that price for the rest of the year. For more info on the deal, head on over to sweetwater.com.